Friday evening. We welcome Erev Shabbat with a brief (45 minute) restorative and song-filled Kabbalat Shabbat service on Fridays at 6:15 pm, timed to allow participants to get home for Shabbat dinner. Every month or two we have a potluck meal following the service. Many members come directly from work, with just a quick stop home to gather the kids. In warm seasons, weather permitting, we greet Shabbat outdoors on our patio. 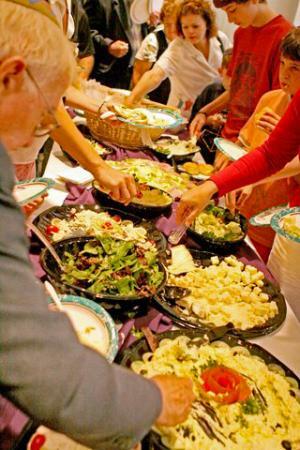 Several times during the year, we follow Kabbalat Shabbat with a congregational Shabbat dinner. These dinners (for which advance registration is required) are sometimes for specific occasions such as welcoming new members, and sometimes just for the joy of sharing Shabbat dinner together. Saturday morning. Shabbat morning services, which begin at 9:45 a.m., are the heart of who we are - egalitarian, participatory, thoughtful and joyful. Our liturgy blends traditional Hebrew prayer with modern understandings and approaches; the davening (prayer) allows us both personal and communal expression as we raise our voices in song throughout the morning, with many of our musically gifted fellow congregants adding harmonies. Our bima, where the Torah is read, is at floor-level; our service is intimate and accessible, physically and spiritually. In the Reconstructionist spirit, the service is a joint effort of clergy and members. Rabbi Bronstein and Cantor Schiller lead the opening prayers (shacharit and the amidah); the Torah service is conducted almost entirely by members who serve as the gabbais, Torah and Haftarah readers and darshans, with Rabbi Bronstein providing context for the weekly parashah (Torah portion). Congregants volunteers sign up in advance to read the Torah and Haftarah and serve as darshan giving an explication of that week's Torah portion. Read more about taking part. Families are always encouraged to attend the main service. We provide a rug and toys in the sanctuary. Children are invited to follow the Torah procession, as well as to help lead the blessings over the grape juice and challah at the end of the main service in the Sanctuary. We also provide free babysitting and concurrent children's programming that many of our young people choose to attend. Babysitting: 10:30am - 12:30pm Children are always welcome to join us at Shabbat services in the sanctuary. If being in the sanctuary becomes difficult for very young children, we offer babysitting every Shabbat morning for children ages two to six, at no charge. Our sitter is selected and supervised by our congregants with young children. This is a safe and warm space for young children to be while their parents are engaged in prayer. Shabbat No'ar: 11:00am - 12:00pm for ages 7-teens. This youth service meets on certain dates throughout the year and provides an opportunity for children to take on leadership roles, including leading prayers, reading Torah, and sharing their learning about the weekly Torah portion. Click here for more information and schedule. We welcome visitors to all our services. Our shabbat morning greeters will be delighted to make you feel at home if you identify yourself as a visitor or a new member. If you would like to have someone host you at a service, please email Vicki Presser, vpresser@aol.com, a member of our outreach committee, and she will gladly arrange for someone to be your host. 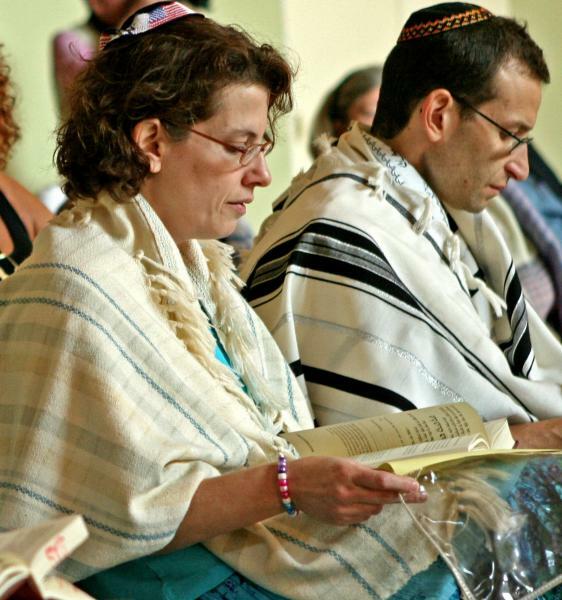 Some congregants prepare for Shabbat by gathering an hour before services for a Jewish meditation session or yoga program, each held about once a month. Directly after services the entire congregation and all guests and visitors are welcomed to a communal Kiddush, featuring a light dairy lunch, coffee and sweets and ample time to meet new friends and old. Several times a year, the BAS program committee arranges acharei Kiddush talks by congregants or guests on a topic of interest. Family Havdallahs are also scheduled a few times a year, featuring a light supper, singing, and bible stories for all ages, and concluding at dark with Havdallah, the brief and enchanting ceremony ushering out the Sabbath. Bet Am Shalom follows the triennial cycle for Torah readings: In this practice, the lengthy Torah portion of the week is divided into thirds. Although the entire portion is studied, only a third of the portion is read aloud at services, third by third in a three-year cycle. Click here for the actual verses to be chanted on each Shabbat and on certain holidays.